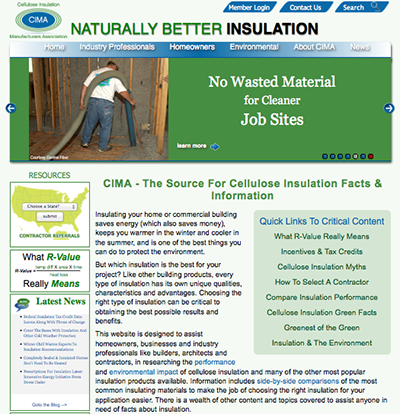 The Cellulose Insulation Manufacturers Association has launched a new website. The new design greatly expands the content, images and graphics, and functionality of the website making it easier for homeowners and building industry professionals to find information. All of the most popular features are still available on the website including technical information on R-Values, the Insulation Savings Calculator, Insulation Contractor Search and of course the Greenest Insulation Blog. Improved navigation across the website makes it much easier to find information and features with links to the most used content available from every page. This is the first major update to cellulose.org in several years and the fresh new design makes the website more graphically appealing. There are new visuals across the site enhancing the text with graphic displays, images and videos covering a wide spectrum of information about building insulation in general and specific details on cellulose insulation. Users can see side-by-side comparisons of the most popular building insulation products and how they compare in terms of insulating characteristics and environmental impacts. Visit the new cellulose.org from CIMA. It’s one of the best online resources for building insulation information. And watch for the new mobile version coming soon. This entry was posted in News & Information, Press Releases. Bookmark the permalink.